The College received 8,698 early action applications this fall, a 25-percent increase from last year. This is the third consecutive year that the number of non-binding applications has risen. 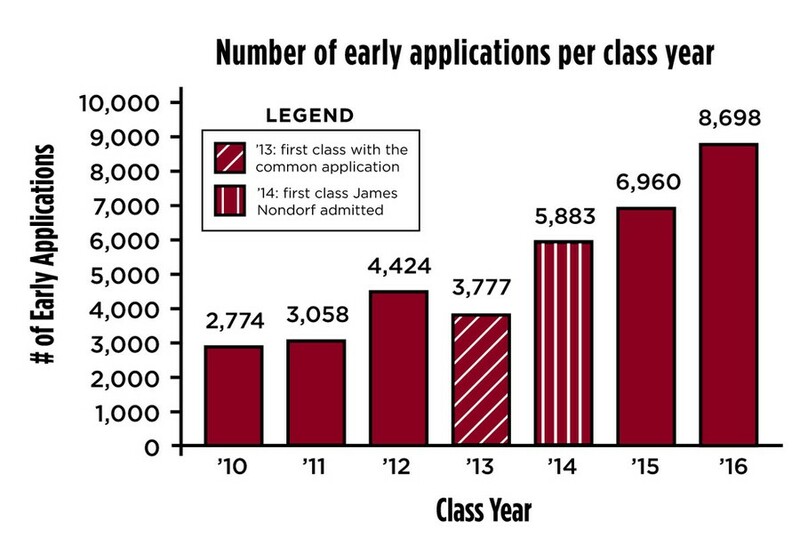 Early action applications have more than doubled since James Nondorf became Dean of Admissions and Financial Aid in 2009: Just 3,777 students applied early action in fall 2008, the same year that the University switched to the Common App. “This is a fresh indication of the passion that students around the world have for the distinctive academic culture at UChicago,” Nondorf said in a statement yesterday. This year’s jump comes as the total number of applicants to the College continues to surge, pushing the admissions rate lower. University spokesperson Jeremy Manier credited the influx of applications to prospective student visits, a wider range of study abroad opportunities, and bolstered financial aid. Financial aid grew by 15 percent this year as tuition hikes brought the cost of a U of C education to $55,416. The Admissions Office has also expanded its presence online with a Tumblr account it created this summer, online web-casts for prospective students’ questions, and a “viewbook” app for smartphones that offers users a visual tour of campus life. “One of the things admissions does very well is that they’re in tune to how people talk about the University,” Manier said. Last year, 31.9 percent of 21,774 total applicants sent in their applications early. An all-time low of 15.8 percent of all applicants were admitted. Manier declined to speculate on whether he thought the number of total applicants would increase this year, though he said that the recent figures reflect a growing trend that more students are selecting the U of C as their first choice. Harvard and Princeton reinstated their early action policies this fall, but Manier does not believe this move will affect College admissions.